Welcome to the Online Parish Clerk pages for the parish of St Newlyn East. With the resignation of Michael McCormick, the original OPC - given that two generations of my forebears moved to the parish to work in East Wheal Rose, and that I administer the neighbouring parishes of St Allen and Perranzabuloe (into which they spread) - I have volunteered to step into Michael's shoes. I would like to acknowledge the enormous contribution he has made to the amount of information which is available online for this parish. The searchable databases of burials and baptisms, linked from these pages, are the result of his work. Moreover, he has been a major force behind the Cornwall Online Census Project and all St Newlyn East census returns are searchable for all years from 1841 - 1891, inclusive. Thank you, Michael! Named for its patron saint, St Newelina, the parish of St Newlyn East is sometimes known as plain "Newlyn" or "Newlyn East". It was also sometimes referred to as Newlyn in Pydar, to distinguish it from the parish of Newlyn near Penzance. It belongs to the deanery and Hundred of Pydar. Geographically, it is bounded on the north by St Columb Minor and Colan, on the east by St Enoder, on the south by Ladock, St Erme and St Allen, and on the west by Perranzabuloe, Cubert and Crantock. Thanks to the lead mine, East Wheal Rose, St Newlyn East was a thriving mining community in the nineteenth century. However, disaster struck the mine on 9th July 1846 when an unusually heavy thunderstorm, lasting an hour and a quarter, flooded the mine. Thirty-nine miners - mainly from St Newlyn East and St Allen - were drowned. (Francis LAMPSHIRE, one of the drowned, had a daughter who married into my Cornish family, and Captain John MIDDLETON, then Mine Captain of East Wheal Rose, was a first cousin of my 3x great-grandmother). 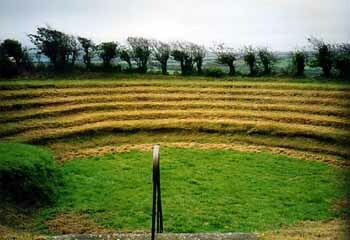 Surviving miners dug a preaching pit (above) in the village as a memorial and as a gesture of thanksgiving. The pit is still used for special occasions. The mine was eventually closed in 1881.